Alpenglow on the peaks above the town of Telluride (which is not visible, but is down in that valley below those big peaks). 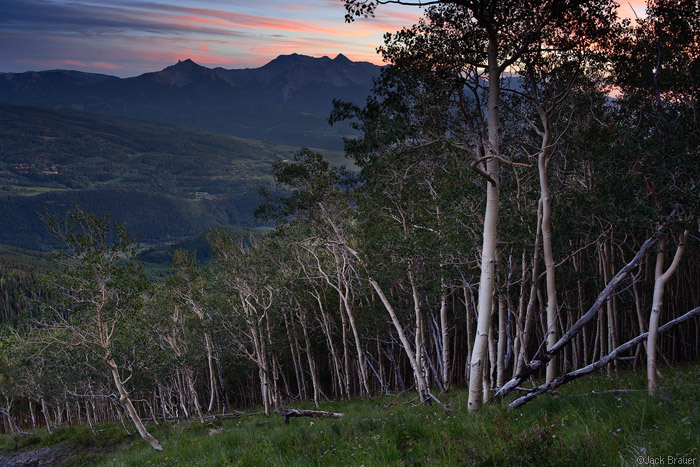 Sunset behind aspens. Wilson Peak and the San Miguel Range are in the background. You can also see Mountain Village at the left. 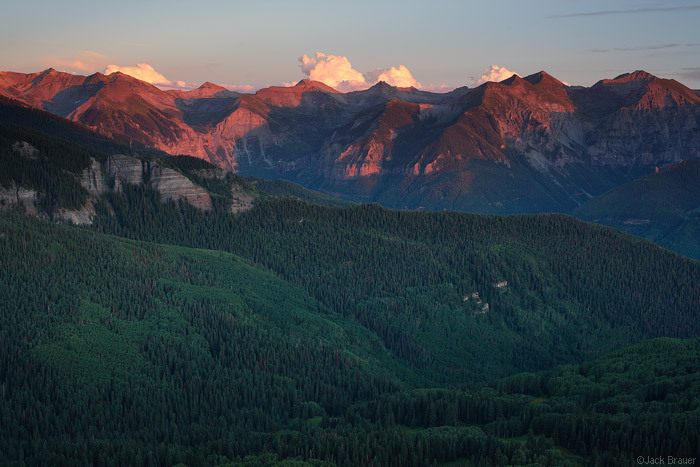 Posted in Colorado and tagged Colorado, San Juans on August 18, 2010 May 19, 2013 by Jack Brauer. ← Previous: "Summer of Light"
Can I have your job! BTW your work tangentially reminds me of the work of Richard Long and Hamish Fulton. Not that you have such High Art ambitions, but the documentation of your journeys, and the fact that you make so many, is similar. In his 60s, Hamish Fulton recently climbed Mt Everest. We’re gettin old too. When we take our kids camping in the Sierras we can no longer stand those lightweight sleeping pads. Aero-beds all the way now! Otherwise, we wake up stiff and crotchety. Spectacular work Jack, thanks for sharing. Nice to see so many living trees over West also. I hike around in the East Weminuche, above Pagosa, and the Spruce are completely ravaged. I understand they are heading West. I haven’t been over there in a while, need to go soon, I will miss those beautiful old green friends. Sorry to hear about the trees dying in the East Weminuche. It’s such a tragedy in Colorado… I hope the beetles don’t make it over to the Ouray side. Hopefully we’ll have a long subzero winter. Hey, it’s not just this long hike that’s making your knees and legs sore! It’s the 14er you climbed the night before, and hm….., maybe the 7 day backpack trip the days before that. How’s Claudia doing? I must admit I love reading about and seeing all that you’re accomplishing…..from the comfort of home! My husband is still wanting to do that hike, but 13 miles sounds too long for me! We did make it up to the Lewis Mine this summer. It was only 8 miles round trip.